Thanks for visiting my blog and posting your comments during my absence. In Mumbai mid term exams are going on, so as a teacher I am quite busy with my work for past few days and then past one week my internet connection had some problem. So I couldn’t visit anyone’s blog or give a comment. Will be back with my posts by Tomorrow or Monday. 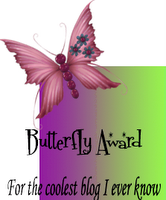 Come back to award ;all Vidya, Suma, Ilatharasi, Sripriya, Purva has honoured my blog with beautiful 'Butterfly Award'... Thanks a ton to all. Usha has given me the Rocking Girl Blogger Award, Thank you so much Usha .you have really Rock my world, thank you for thinking me worthy for this award.. I consider myself lucky that few of my friends consider me and my work worthy for these awards. Thank you my friends for bestowing upon me ur love in the form of these awards.